The start of a new year often has people thinking about how they can change something about themselves. But sometimes, change is about getting back something that was lost. At Benton Physical Therapy, their goal is to create a customized plan with their patients that fills what was missing from their lives. “We’re here to give you back something that is missing in your life. A lot of times you’re coming here to make yourself better. We’re going to look at what’s going on with you and design a program specifically for you. I don’t do cookie cutter PT,” said co-owner Dale McPhearson. Dale partnered with co-owner Doug James after the pair saw a need. Dale was working at Specialists Hospital and Doug was looking to grow his business from the location that existed in Stonewall. Dale said he was treating a lot of patients from Benton and Bossier while at Specialists, which led to their location on Burt Boulevard. “There was no PT clinic here. This community is growing by leaps and bounds and people needed our services. They were driving all the way from north Bossier to Shreveport and needed a clinic of their own out here,” Dale said. The clinic’s goal is simple: It’s whatever the patient’s goal is. That could be giving them something back that is missing from their lives, such as mobility or living with less pain, to better quality of life. Dale said their therapists at the clinic sit down and establish what the patient wants to accomplish and they work towards that goal. An example of the transformative work that they can do was exemplified by a patient who had been unable to walk since Christmas. He was suffering in pain for weeks. One treatment and Dale said the patient had his normal life back. “We had a patient in dire straits, he couldn’t walk and was in tremendous pain. Here was someone who couldn’t spend the holiday with his grandchildren like he wanted. We were able to find out what’s wrong and give him that quality of life back,” he explained. 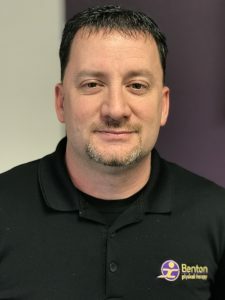 Dale said this is something their clinic encounters on a daily basis, with patients after a surgery or after an injury wanting to get back the part of their lives that is missing. He says Benton PT is able to give back normalcy to their patients. “They come in here on walkers, barely moving, and being able to give back some quality of life is awesome. To give back a portion of what’s missing in their lives is a tremendous blessing,” Dale said. He said most people think PT is only about an injury or pain, but it also serves to help dysfunction. For example, there are golfers who can’t hit the ball like they used to or a weight lifter who can’t bench press as much as they used to. Dale said physical therapy doesn’t have to be to address pain or help after a surgery. Benton PT offers spine therapy, post-operation conditioning, and pre-operation care. He said they also offer dry needling to stimulate muscles using electricity. 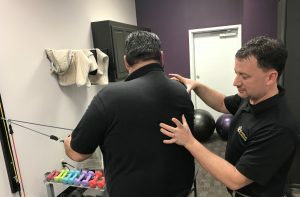 “You have a patient who has a car wreck, or sit at their desks on a computer 24/7 so they have a group of muscles that aren’t working correctly, they’re too tight to allow the joint to move or it’s not firing like it should. So, we use a needle with electric stimulation and it can significantly improve range of motion. I’ve had patients see immediate relief,” Dale said. As January dawns, people begin setting resolutions and thinking more about their health. Dale noted that improving one’s self should be a continual process. He also noted that everyone is different and that a cookie cutter program online doesn’t work for everybody. He stressed the necessity to be active all year long and make achievable goals for yourself. Benton Physical Therapy celebrated its one-year anniversary January 15th. After their first day in business saw a snow and ice storm, Dale questioned if it was a message from above that he should reconsider. However, he said the past year has brought nothing but good news with the clinic developing a great relationship with the community.